Excel Split Cells Function to divide into multiple rows or multiple columns how to! 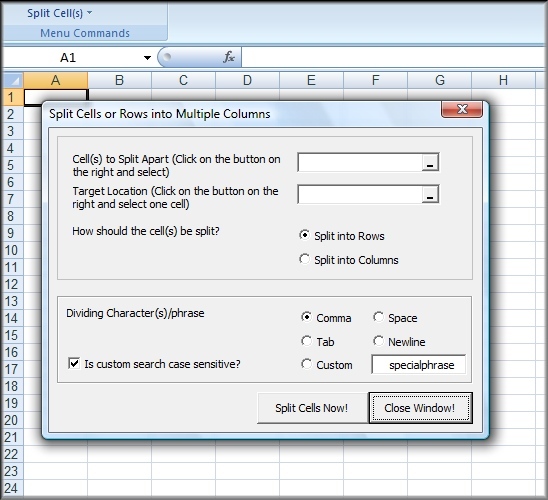 Excel Split Cells Function to divide into multiple rows or multiple columns Software! Get it now! Only $29.95 U.S. (Regular $49.95 US!) for a limited time! Split excel data by certain characteristics (i.e., split excel cells by phrases, split by special delimiters (i.e., tabs, commas, etc), and more! Use it to break up sets of names, sets of financial data, unformatted text, and more! And finally, it simply makes it easier to manage large sets of data!